Is there a chess system where you can make players of differing skill levels compete against each other with an equal chance to win without using different chess variations? This system should give good players and bad players a level playing field where both of them can win. The way I've done this in the past is to play a series of games with clocks starting with 10 minutes each on the clocks and then the rule for subsequent games that the winner of the previous game gets one minute less and the loser one minute more. This quickly stabilizes at a level where both players have good chances of winning. The strong player plays multiple simultaneous chess games against each of the weak players, walking from board to board. That means the attention and time of the strong player is divided among all the games while the weak players can focus their full concentrate on just their own game. The handicap of the strong player can be adjusted by adding or removing opponents. This sounds like you want to take the player's skill out of the game which goes against the spirit and rules of chess, I would say. You could introduce elements that equalize skill differences but you may end up with a completely different kind of game, which you wanted to avoid. 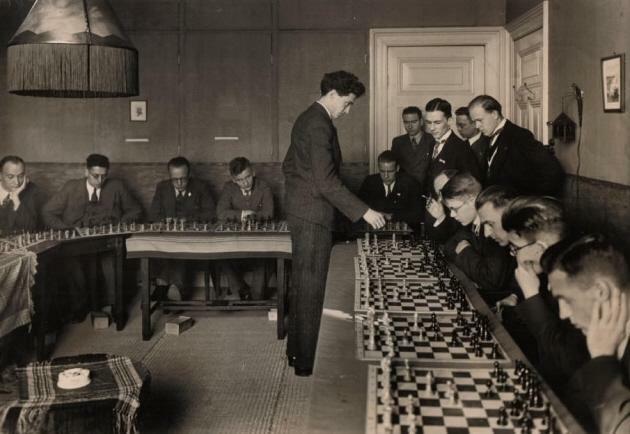 For example you could introduce some kind of handicap or bonus (less time for the higher skilled, less chess pieces to begin with for the higher skilled, more chess pieces for the lower skilled (analogously to Go), other side tasks for the higher skilled) but that would require that you know the skill differences in advance or detect them while playing. Please note, that winning chess for a lower skilled player because the higher skilled opponent had some kind of handicap is not the same as winning under otherwise equal conditions. In chess as most people play it, the definition of winning (in a statistical sense) means that you are higher skilled. Your definition of winning seems to be different (independent of skill). It would be a different kind of winning. Indeed one could switch sides at random times as RemcoGerlich pointed out, and it would formally solve your problem, but in that case winning would be very much meaningless. That's why I conclude that no, there is no such way. Either the stronger skilled players will win more often in chess, or the definition of winning becomes meaningless and some other kind of metric depends on the skill (like the handicap) or it's not standard chess any more. The ultimate handicap is teaching. Typically we assume that the person with the winning position on the board is a winner, and the person with the losing position on the board is the loser. But this does not always have to be true. The more advanced player can always choose a different win condition. Why not? It's only a game. If the more advanced player chooses a win condition that isn't in direct opposition to the less advanced player winning, then you can actually reach a win-win situation. You might be able to develop a clever handicap system where players have to "play their best" to beat the opponent with a specified handicap. Go actually has this, though one quickly progresses to the point where a 2 stone handicap is too much. If you do this, you quickly create a game of "you vs. nature" The game becomes a zero-sum game and it really changes how it feels. However, if your goal is to create situations to help teach the newer player, it doesn't matter how skilled you are. You are no longer playing on the board. You are playing in the mind. And, honestly, we can all use a little practice in our quest to become a grandmaster at that. How to learn Xiangqi (Chinese Chess) or Shogi (Japanese Chess)? Are there any chess 960 positions where black has the advantage?